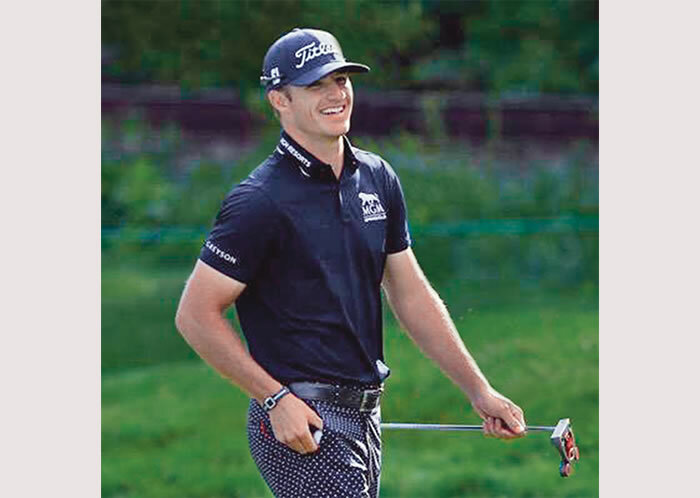 In 2017, PGA Tour golfer Morgan Hoffmann surprised the sports world by revealing that he had been diagnosed with facio-scapulohumeral muscular dystrophy (FSHD). Hoffmann made the announcement in an article for The Players’ Tribune, where he reflected on his career, his feelings about the diagnosis and his thoughts about the future. Recently, Quest followed up with Hoffmann. What was your awareness of neuromuscular disease before you were diagnosed? My awareness of muscle atrophy began in 2012 right after I left college. It started with my right pectoral atrophying from my sternum toward the underarm. The atrophy was small in the beginning, maybe 1-by-2 inches. For the next five years it progressed throughout almost the entire right pectoral. During that time I traveled to countless doctors and specialists in North America. They conducted MRIs, EKGs, EMGs, nerve concussion tests, CAT scans, a stomach biopsy, etc. Long story short: No one could find a cause or a diagnosis. Why did you decide to share your experience? I decided to write The Players’ Tribune article because I knew that I could help and reach many people with this “incurable” disease. I figured if I kept to myself it would be very selfish. With my platform, I knew I could make a difference, and The Players’ Tribune was very supportive in making my message heard. The reason I have “incurable” in quotes is because I believe it most certainly is curable, we just need to search in the right places. What kind of feedback have you received since revealing your diagnosis? I have been so lucky with the most incredible feedback from writing the article and announcing my health condition to the public. I am so humbled and amazed with how nice and supportive people from all ends of the earth have been. Countless families, friends and strangers contacted me through email, text, calls and social media. I’d say one-quarter of them either have a neuromuscular disease or know someone close to them who has been diagnosed. Many individuals have told me their stories and offered advice with how to cope. Some have even come forward for the first time, electing me to be the first to know. I have made sure to reply and offer my advice, comfort and nutrition beliefs to every single person who has reached out to me. How have your fellow golfers reacted? My fellow golfers have been a very good support system. We hosted our first Morgan Hoffmann Foundation event at the Palm Beach Boat Show several months ago and many of them showed up and even bid on our auction items. It is really cool to see how our PGA Tour community is so helpful, philanthropic and caring. How important are family and loved ones in keeping you going? I have been extremely lucky with the friends I’ve grown close to over the years. I don’t really call them friends anymore; they are now my family. I am so grateful to have an amazing support system from my whole family. The energy and love that I have received has been out of this world. It is a huge factor in keeping me going to find a cure, make a difference and shine light on neuromuscular disease. Learn more about the Morgan Hoffmann Foundation at morganhoffmann.org. To learn about MDA’s research across diseases to uncover breakthroughs for treatments and cures, visit mda.org/research.